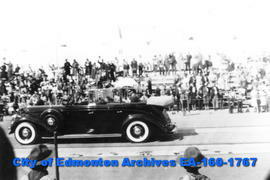 Of Mike's News Stand; in a 1929 Hupmobile Eight.See also EB-27-86 and MS-604, f. 70 - Scrapbook #1, p. 41. SPCA car from Austen Healy Motors. Safety check-up on cars. Const. T. Jones checks broken headlight. Sgt. 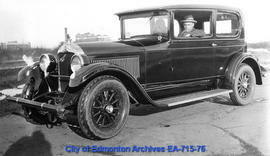 Albert E. Woodwards, Edmonton City Police, inspecting wrecked automobile. Shrine Circus arrives: Kinko the clown squeezes into small car.